Two years after David Amiran arrived in Palestine (1935), Picard arranged a research grant for him to prepare maps for the Atlas of Eretz Yisrael. Since Amiran enlisted in the British army, work on the Atlas was suspended, and only resumed in the 1950s, after the Department of Geography was established. The scientific editorial board of the atlas consisted of Amiran and members of the German Group, who believed in imparting geographical knowledge for the benefit of the state. With funding from the State of Israel and the Jewish Agency, they were able to publish a handsome atlas. In this connection it is possible that such cooperation aimed to promote national causes (“achievements of the state”, “the heritage of the fathers”). Thus, the Atlas of Israel is indicative of a symbiosis between the governmental and academic establishments. Members of the academic establishment contributed scientific methodology and classic research instruments that were appropriate to the task and the governmental establishment provided financial support for research and publication. In this way, the Atlas of Israel continued the trend of conveying political and ideological messages in maps that emphasized Zionism. One of David Amiran’s most famous scientific projects was the National Atlas of Israel and documents which have only recently been uncovered show the beginning of this idea and its implementation about ten years before the establishment of the State of Israel (in 1948). In this article we will try to show how the tradition of Geography that David Amiran absorbed in Germany influenced the design of the Atlas of Israel in several areas: in the conception of Geography, cartographical methodology and on the subject of national consciousness. Since this atlas was defined as a “national atlas” we shall first of all relate to three subjects that form the background: (a) what a national atlas is; (b) what cartography has to do with mass persuasion;(c) the establishment of a link between national consciousness and regional geography. “National atlases” act as one of the symbols of unity and national pride and one should relate to their appearance at the end of the 19th century as part of the rise of nationalism, the development of science and its public importance claims Monmonier (1991) who goes on to state that, up till the Second World War, the national atlases that were produced in Western Europe and North America more expressed the achievements of science and usefulness of the atlas as a helpful tool. In the two generations after the Second World War, however, the number of national atlases grew considerably from less than 20 to more than 80. These new atlases not only indicate the development of post- colonial nationalist identity but also the economic and social achievements of those same political entities. He goes on to claim that the national atlases were produced to provide legitimacy and sanction for territorial conquests, cultural imperialism and social and economic change. Apart from their role of being informative cartography in general and atlases in particular they fulfilled the role of being agents of socialization and “mass persuasion”. Through them the political power attempts to publicize its ideas, justify its approach and perpetuate its actions, especially in matters of its territory, borders or size. In this way cartography contributes to the needs of territorial socialization and national identity (Wood, 1972). Attention was drawn to the direct deliberate use of cartography for propaganda purposes in scientific literature during the Second World War (Speier, 1941) and years later to the manipulations carried out by map editors in the following details: symbols, projections, colour, shading, typography, statistical data, and the combination of maps. Every one of the above details is vulnerable to the manipulative ability of the map maker without the map reader being aware of any deliberate and misleading use being made of them. The maps can lead to a mistaken interpretation of reality even among those who are skilled in reading maps (Ager, 1977; Black, 1997). The use of bias in maps is common today as well for political and economic purposes (such as tourist maps) and one needs to see this bias as part of the overall cultural structure of mass persuasion through controlling a variety of communications media. It would not be too much to say that the feeling of nationality and its relation to territory, something dealt with by Herb and Kaplan (1999), is as clearly expressed in the array of maps and atlases as it is in other cultural elements such as language, festivals, literary and artistic works and so on. Every other “national atlas” or “regional atlas” that was produced derived its foundations from the “regionalism” that originated and developed during the second half of the 19th century in Germany at the time that they were seeking roots and the identity of different regions after unification in 1870 (Wardenga, 1999). At the turn of the century regional geography began to achieve an important status in universities (Dickenson, 1969) and this was expressed by the emphasis placed upon regional research and publications, by the appearance of regional monographs and by regional research into areas outside of Europe. During the First World War geographers became involved in regional research projects and the uses made of different regions and, although the data collected was for the purposes of military intelligence, it also served the political needs of the post-war period. After the First World War regional geography was seen by some German geographers as an area that could strengthen the status of the country during that difficult time (Wardenga, 1999) and, as a result, regional research broadened in the direction of Volks-und Kulturbonden (the people and their culture): the collection and analysis of data that would assist the claim that certain regions characterized by the structures of language, history and settlement were German territory. The German government saw this research as important and cooperation developed between German academics and the government. Professor David Amiran, who studied in Freiburg at the end of the 1920s, was exposed to these scientific approaches and the worldview that accompanied them and applied them to his “Atlas of Israel”. The atlas which began to appear in the 1950s had a pronounced nationalist-Zionist message and, since it symbolized European scientific enlightenment and superiority, was called “a ramified scientific- national project” by its editors. Further on in this article we will review the history of the atlas and will attempt to assess its significance in regard to the issues of strengthening the sense of nationality and increasing Zionist and Hebrew identification with the assistance of cartography. From the perspective of our times and using a critical approach it is possible to expose “hidden dimensions” that directed the work of the editorial board of the atlas through an analysis of the first (Hebrew) edition of “The Atlas of Israel” (1956). The emphasis of the article will, as aforementioned, mainly be placed upon an analysis of the first edition in Hebrew while other references will be made to the second (English) edition and the bi-lingual, updated third edition (1985). As already noted the moving spirit and central agent of the subject of Geography was David Amiran who was born in Berlin in 1910 and, after completing his high school studies, decided to study Geography in Freiburg in 1929. At that time in Freiburg there were two teachers: Hugo Hassinger and Hans Schrepfer, and Amiran was very influenced by Schrepfer, his teaching, his nature excursions and his research. Schrepfer also admired the diligence of his student and it is no surprise that a year later they published a work together (Schrepfer and Kallner, 1930). Amiran followed Schrepfer to Frankfurt, continued to study in Berlin and completed his doctorate in Switzerland in 1935. In his studies in Germany Amiran absorbed the regional approach as the focus of geographical study as well as the belief that maps and atlases were the highest expression of geographical research. Together with the research methodology Amiran absorbed the hidden messages that were transmitted through the subject of Geography –such as the link between nation, culture, maps and territory. In 1937, about two years after he arrived in Eretz Yisrael (Palestine), David Amiran presented the idea of “The Atlas of Eretz Yisrael” as a project in order to receive the status of research fellow at the Hebrew University in Jerusalem. Financing for this project was provided by the research funds of the Jewish Agency which specialized in Jewish scientists who had emigrated from Germany. During the 1930s he collected information, utilized his friends from the “German Group” to carry out some of the work and presented the Zionist movement’s functionaries with a partial draft of the atlas. A public exhibition of the first maps was even held in May 1939. With the outbreak of world war the financial support was cancelled and Amiran joined the British army.iv In the meantime members of the German Group received important jobs in different British institutions such as the Survey of Palestine and the Meteorological Service. After the establishment of the state in 1949 Amiran received an appointment to establish the Geography Department at the Hebrew University and, together with his colleagues from the “German Group”, a decision was made to continue the atlas project at the beginning of the 1950s, in fact, to carry out Amiran’s program which had been designed twenty years earlier. They recruited other people, mostly German immigrants with whom they had formed connections in their service with the British army during World War II or in the IDF (Israel Defence Forces). It is no wonder that the editors of the atlas and the heads of sections were from the kernel of the “German Group” and, of the 14 main section editors of the atlas, ten were German immigrants. In general it is fair to say that Amiran (whose teacher, Schrepfer, was interested in Finland, researched it and gave courses about its atlas) designed the Atlas of Israel based upon the Atlas of Finland. Amiran was familiar with this atlas while still a student in Freiburg at the end of the 1920s and it is well known that the Atlas of Finland began to appear twenty years before Finland achieved independence. Amiran was familiar with this atlas while still a student in Freiburg at the end of the 1920s and it is no coincidence that Amiran’s initiative to prepare a national atlas for Israel itself took place about ten years before the State of Israel was established. Amiran understood the importance of the atlas for the crystallization of a national identity and for providing support for territorial demands. Thus it is no wonder that, from a general point of view, the Atlas of Israel is similar in structure to the Atlas of Finland. After the presentation of two general maps showing Finland’s location in Europe the atlas opens with cartography and goes on to the information bases of geology, physical features, climate and finishes with education, culture and law. What is displayed is a number of similar specific maps such as: special geographic regions or, for instance, a map of the jails. In the Atlas of Israel, however, the historical part is very prominent when compared to the historical part in the Atlas of Finland. During the period when the first edition of the atlas was being prepared no ideological issues were raised and not many discussions were held by the members of the editorial board about ideas. From what we can learn from the pre World War II documents and evidence about the work of the editors during the 1950s it appears that the approach was pragmatic and cartographically professional. One should note that the same editorial board also continued to work on the publication of the English edition (1970) into which only a few changes were introduced although there were updates consistent with the new findings of research. About a decade later when they decided to publish an updated bilingual edition (1985) most of the veterans on the editorial board were replaced, the number of people involved in writing was enlarged and several emphases were changed in line with the differences in the worldview of the atlas’ editors most of whom were members of the second generation of Israeli scientists and government functionaries. The atlas appeared in a very large format and its first sheet appeared in 1956/57 followed by about a hundred sheets including 720 maps. According to our current economic concepts the production of such an atlas would have to be in the millions of dollars and this production was made possible because of a national agreement made between the Israeli government’s Ministry of Labour and the institutions of the Zionist Movement. If we adopt the approach of Benedict Anderson (Anderson, 1983) we can assume that when the atlas was written in Hebrew its purpose was to serve the internal needs of the state and the Zionist movement, not only as a source of information (e.g. the amount of rain and the number of residents in each settlement) but also for educational needs and perhaps even for the needs of public relations and propaganda (e.g. the achievements of the state, the heritage of forefathers, the right to the land). The “Atlas of Israel” thus signifies a symbiosis of the state and Zionist establishment and academia with one contributing the classic scientific methodology and research tools suited to the task and the other economic support for the research and publication. It is no wonder that in the foreword to the atlas it is referred to as a “ramified scientific-national project”. The atlas was thus an incubator for the products of national identity: place, language, borders and historical memory. The Atlas of Israel was designed in the classical spirit of regional geography opening with a survey of the physical information base of the area and finishing with cultural elements based on the assumption that the physical features influenced social, cultural and economic processes. One should note that the “German Group” was not faithful to the deterministic regional approach and tended to present the findings according to the possibilistic approach in which the conditions of nature produce a variety of possibilities that every culture will respond differently to. The second approach was more suitable to the dramatic description of the changes brought about by Zionism in Eretz Yisrael whereby the Zionists tamed nature in Israel while the Arab fallah was dependent on the conditions of nature. To prove this claim they presented a host of comparative maps such as: “The landscape of Eretz Yisrael in the 19th century” next to a map of “The landscape of Eretz Yisrael in the 20th century” – after the spread of Zionist settlement. The country was a wilderness awaiting renewal by the Hebrew people. One can assume that, on the background of Zionist activity and the establishment of the State of Israel, a scientific document such as the Map of Israel provided support for the claim of “our right to the land”. The maps in the atlas, which are seen as true representations of reality, can act as persuasive evidence for the historical political claim of the Zionist movement and the State of Israel. This was clearly expressed in the name of the atlas and in the framework of the basic map of the atlas as we shall see in the following section. The Jewish perception of the borders of Eretz Yisrael is inspired by the biblical stories and from the long history of the days of the First and Second Commonwealths (Schweid, 1979). These traditions were not only passed on in the Jewish tradition studied throughout the years of the Diaspora but also appeared in “secular” books that pre-dated the creation of political Zionism. One can assume that such perceptions formed the basis for Zionist claims for the area of Eretz Yisrael but it appears that, in practice, the name of the atlas and the areas dealt with by its maps express one of the results of internalizing the “German heritage” as will be clarified anon. Paul Claval points out that at the turn of the twentieth century French and German geographers were dealing with questions of identity but each related to a different notion of identity. The French had a problem with the identity of the “nation” expressed by the questions: “Who is a Frenchman?” and “What is French?” and, as a result, they tended to emphasize the ethno-cultural-historical aspect in their research. The French had no identity problems with the borders of their country or “What is France?” In contrast the Germans had no problem defining who was German or what “Germanness” was but they had a problem defining what Germany was. They were in search of the borders of their country and so turned to the landscape, physical geography and determinism (Claval, in Hooson, 1996). This confusion about identity grew in Germany after the First World War and the loss of lands that were at the heart of the German national consensus. The political intellectual tension created by this situation caused many German geographers to adopt an activist position and devote themselves to explaining the significance of the new spatial relationships that had been created. One of the peaks of the crystallization of these approaches took place at the conference of German geographers in May 1921 in the city of Leipzig where a call was issued to harness the subject of Geography to German national rehabilitation. One of the ideas that appeared at that time was the idea to distinguish between three types of borders: natural borders, historical-cultural borders and political borders. At the same time Avraham Yaakov Brawer, who was living in Vienna and had adopted the idea of distinguishing between different types of borders, expressed this in his book Ha’aretz ( “The Land of Israel”) (1927) which was published in Jerusalem.v In the book he presented these three typical kinds of borders of Eretz Yisrael as “decreed from on high”. Brawer distinguished between Eretz Yisrael with its wide historical borders (the borders of “the promised land”), Eretz Yisrael with its natural borders (from “the river to the desert”) and Eretz Yisrael with its political borders (the “British Mandate”). One can assume that Brawer’s distinction between the different types of borders suited the political reality in which the Zionist movement operated at that time (Beiger, 2001) and, when Amiran presented his proposal to produce the atlas in 1937 in a period when the political tension in regard to the plan to divide up Eretz Yisrael was at its height, it was obvious that he should produce the “Atlas of Eretz Yisrael” which would show the country made up of four natural longitudinal strips of land which Brawer characterized as the coastal plain, the mountain area, the Jordan Valley and trans –Jordan. From the point of view of that period the above atlas reflected, on the one hand, Mandatory Eretz Yisrael and, on the other, the Zionist conception of the spatial definition of Eretz Yisrael as presented at Versailles (Galnoor, 1994). The political borders – the mandate border and the “Green Line” (the cease-fire border of 1949) mainly appear in the maps that deal with economic, social and settlement subjects but appear faintly in the physical maps of the country – those dealing with geology, geomorphology and so on. Thus the reader of the atlas can easily receive the impression that the country has both “permanent borders” – which are the natural, physical borders and “temporary borders” – the green line and the mandate borders (Bar-Gal, 1999). In the English version of the atlas (1970), in accordance with government policy, the “green line” was removed from the maps of the Israeli Survey as well as the “basic maps” of the country. Similarly in the introduction to this edition there is a reference to the question of what types of borders are presented in the various maps. The editors claimed (in the introduction to the second edition) that, in regard to the physical maps, the limits of knowledge available represented the borders of the part that was mapped. The political and military events that took place after 1970 led the editors of the third edition (1985) to sum up the subject of the frequent changes of the borders of “Israel” with a series of four maps which show the changes in political and administrative borders of the country and which detail the changes that took place regarding the northern and southern borders. We can move on from the spatial presentation of the country’s borders to their presentation in the dimension of time – the historical maps. There is a basic assumption and shared belief among the map editors and their readers that the “spatial axis” needs to maintain a single scale within the map; otherwise the space is distorted, strange and removed from the reality the map is supposed to represent. In contrast the map editors feel “free” to present the dimension of time as they wish and adjust the time “scale” to their ideational needs – meaning that they “stretch or shrink” the entity of territory along the axis of time. Take, for example, the first edition of the atlas where there are 52 maps in the historical collection which describe the borders of Israel, its settlements and landscape during different periods. These maps cover the period between the settlements of the tribes (1300 BC) up to the beginning of the twentieth century – altogether 3300 years of history. If we use the simple measure of the number of maps for each period a clear picture will emerge: 9 maps describe the country up to Shivat Tzion (The Return to Zion) in 536 BCE; there are 26 maps of the period from the Second Commonwealth till after the destruction of the Temple (70 AD); 10 maps present the next 2000 years which include the periods of the Arabs, the Crusaders, the Ottomans and others. Thus it seems that on the axis of time use is made of a “values scale” which over-details the Second Commonwealth period, and under- details the long periods of exile. Of course one also has to relate to this on the background of the amount of information and historical sources available and while this claim is perhaps valid for the ancient period it is hard to use it in relation to the modern period. In the second (English) edition the same historical maps return and in the third edition there are no historical maps at all that are similar to those presented in the first edition. The conversion of the map of Israel into a Hebrew map was, in fact, a determination of the concreteness of Hebrew culture and the political and Zionistic aspirations for the territory of Eretz Yisrael and represents a completion of the political and military achievements. After the War of Independence (1948) the activity of Hebraicizing the names of places and sites in maps of Israel was no less important than the physical acts of settlement and it was carried out by the “Names Committee” which was attached to the Office of the Prime Minister (The Atlas of Israel, 1957). Before the establishment of the state the “Jewish National Fund” (a Zionist executive organization), was the institution which took upon itself the process of hebraicizing the map of Israel with the help of the “Names Committee”. The rationale that fueled the process of hebraicization was the need to renew the ancient Hebrew names that had been forgotten from the landscape of Israel and the renewal of these ancient names was faithful evidence of “the land being the cradle of our forefathers since time immemorial and that our right to these places was historical and absolute” (Azaryau and Golan, 2001). It is no wonder that the first budget for preparing the atlas of Eretz Yisrael was solicited by the “German Group” from the “Jewish National Fund”. After the establishment of the state the task of hebraicization was transferred to a state authority. The publication of the atlas was thus the completion of the process of hebraicizing the map and the creation of a state standardization of Hebrew names for places in Israel. This also explains the readiness of the State of Israel and the Jewish Agency to fund this expensive project since they saw it as an important “Zionist project”. The Hebraicization of the atlas was especially expressed in the cartographic section where the “1:250,000 map of Israel” appears accompanied by an index of names of settlements and geographic sites. This list consists of 4000 names classified with two separate indexes: names within the territory of the state of Israel, and names outside the territory of the state. Obviously the 2000 names within the territory of the state are Hebrew names and include the names of mountains, rivers and different geographic sites. In the same way that this list signifies hebraicization it, at the same time, also signifies the erasure of the Arab names that were once used in the country. The hebraicization of the names is especially prominent when one compares the list of places within the territory of the State of Israel with the list of names outside its territory where the geographical sites usually had Arabic names. Here as well when the sites had ancient Hebrew names this was preferred to the Arabic names, for example: Sh’chem, Hebron, Har Gerizim or Emek Dotan. When the atlas appeared these were Arab sites and cities under Jordanian jurisdiction on the “West Bank”. The way two separate lists of place names that relate to the same map are displayed is very unusual from a cartographical point of view. If the whole list was organized alphabetically the Hebrew names of places in the country would have been engulfed by the Arabic names appearing on the map and, in this way, the action of “hebraicization” of the map of Israel would have been harmed. One should see this form of indexing in the Atlas of Israel (first edition) as a political-cultural declaration of the appropriation of places for Hebrew culture. In the English edition in 1970 the translation of the names from Hebrew to English was done according to the official translation while in the third edition, which is bi-lingual, they also added the Hebrew name in Latin letters for example: Yerushalayim= Jerusalem; Shekem = Nablus; Yam Kinneret = Sea of Galilee. Obviously in this edition the Arabic names of places in Israel were neither written in Hebrew letters nor Latin (Yerushalayim = El-Kuds or Hebron = El-Khalil). Finally one should also note that the “Atlas of Israel” was an important instrument not only because of the hebraicization of the map but also because it hebraicized the scientific language. The descriptions and analyses that accompany the maps assisted in the creation of professional geographic terms that were easy to use for the residents of the state. Hebrew names for natural phenomena such as geomorphological or climatic processes, which were terms produced co-operatively between the university and the Academy for The Hebrew Language, acted as an important tool for spreading this information beyond the walls of academia. The atlas emphasized the ethos of the “new Hebrew”, the Diaspora Jew who had returned to his village and land. The atlas as a visual presentation that served Zionism and national feelings is no different from other presentations that were produced to commemorate the return to the land such as poetry, literature, ceremonies, film and so on. In the atlas, however, there was special emphasis placed on agriculture compared to other branches of the economy and, despite the fact that there were about 70 maps devoted to different aspects of industry, agriculture is dealt with in close to 100 maps and charts. This is in addition to maps devoted to Hebrew rural settlements. Clearly the maps stress Jewish agriculture and industry and there is only meager reference made to agriculture in the Arab settlements (olives, tobacco and grain crops). Such a detailed mapping of “the uses of agricultural land” was part of the tradition which the members of the editorial board grew up with since the village and agriculture signify “rootedness” in one’s nation, on the one hand, and the “typical rural landscape” of a particular region on the other. If, from the point of view of Israel’s economic development, there was some justification for the emphasis on agriculture in the first editions of the atlas, there is no such justification for this in the third edition. In the third edition, however, there is also an over-emphasis on the subject of agriculture despite the fact that, from a national economic point of view, the value of agriculture was much lower during the 1980s ( a small percentage of the GDP and employment).The third edition, for example, offers 16 maps devoted to the distribution of different types of industry throughout the country, as opposed to 48 maps that deal with agriculture and, in addition, there are six maps that deal with agricultural industries such as wineries and dairies. When one compares the editions one can clearly see a greater reduction in the number of maps that deal with industry than with those that deal with agriculture. One can, of course, relate this to methodology – since agricultural areas can be clearly seen in the landscape and can be impressively mapped in the atlas compared to industrial plants. Similarly the study of the maps involving “the uses of agricultural land” in the atlas and comparing them to the reality of the region via study excursions is another instrument of socialization that makes it possible to prove the “concreteness” of Zionist endeavor – the flowering of the wasteland. The Zionistic autocentrism of the atlas is also displayed in the way the “invisible people of Eretz Yisrael” – the Arab population is signified. In most of the maps, for example, when they show the data of the population census they present the figures about the Jewish population but do not present the parallel figures about the Arab population. In the demographic section of the atlas (first edition) there are 22 maps two of which are devoted to the Arabs, seven general maps and thirteen maps devoted to the Jewish population. In the section on employment there are 24 maps all relating to the Jewish population. The blurring of “the invisible man” in the Atlas of Israel also expresses itself in the choice of colours that indicate the different populations. The Arab population is marked in light green (in the first edition of the atlas) which fades into the background of the general grey colour of the basic map while the Jewish population is marked in bright red and the strength of this different colour also influences the impression the reader of the map receives. 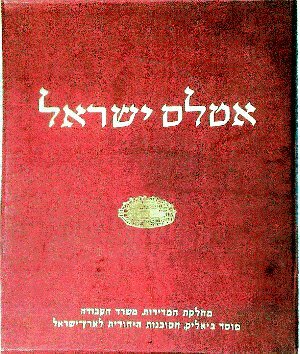 The thesis that the “Atlas of Israel” acts as an official document that strengthens the Zionist ethos was tested after the appearance of the third edition when the atlas became the centre of a public-political-media argument as shall be shown in the following. After the atlas was published (3rd edition) and distributed inside and outside of Israel an article appeared in the satirical section of a daily newspaper written by a right wing journalist entitled: “ The Atlas of Israel – Into the Bin” (Ma’ariv, 6.8.86). 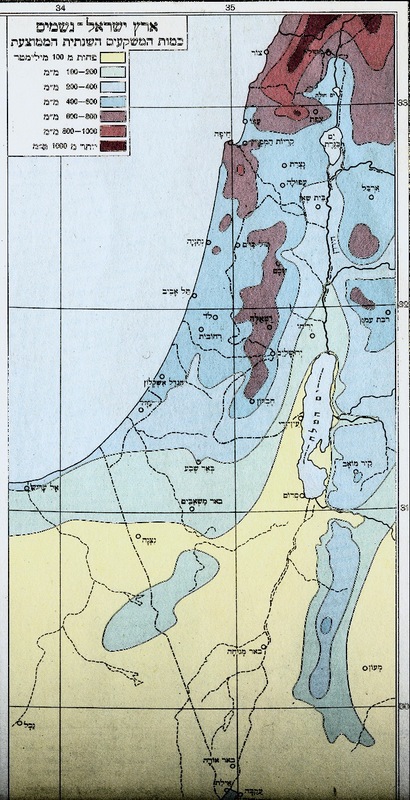 The journalist did not like the critical text, written by Professor David Amiran himself, that accompanied the map describing the Jewish settlement in the “West Bank” and suggested that the distribution of the atlas be stopped in order to re-write the maps in a way that would better suit the policy of the current government – a right wing government that supported and encouraged this settlement. When, the next day, the subject was brought to the attention of David Levy, the deputy prime minister and the person responsible for the Israeli Survey, he gave orders to stop the publication and distribution of the atlas and discharged the editorial board. The Israeli academic community widely advertised its objection and rejection of the steps taken by the government in regard to the atlas but, despite this, a geographer who was not in academia, was found who could re-write the explanations of the map in question. His re-written explanation was made the official, corrected text in the atlas and was distributed widely – also to those who had already purchased the atlas in Israel and abroad. The event described above did not directly touch upon the cartographical expression of the map but one can learn much about propaganda, cartography and political power from it. It is possible that the journalists or politicians did not raise any questions about the graphical presentation itself since they couldn’t understand it and saw it as a true description of the reality. The argument was about the interpretation that was to be given to the Jewish settlement processes presented in the map and dealt with following question: Should the Jewish settlers in the West Bank be seen as “public emissaries”, the executors of government policy, or, perhaps, as representatives of militant groups aspiring to create facts which, in the future, would not make it possible to separate the “West Bank” areas from the territory of the State of Israel? Since the “Map of Israel” was a “state-scientific project” it appears that the powers that be thought that the editorial board should not have departed from the political conception. Accordingly the above event strengthens the central thesis of the article about the extent to which this scientific project served the nationalist and state goals, assisted by academia, of creating presentations for the purpose of mass persuasion about the justification of an ideological course. In other words the objectivity that we try to find in presentations (such as maps, statistical data, articles and books) that are the result of academic research have to be examined and judged with great caution since they may be loaded with certain hidden dimensions that not even their creators are aware of. The atlas both symbolizes and perpetuates a disciplinary tradition that was given birth through linking science and nationalism, a tradition assisted by using the technique of mapping to present different findings and claims. This connection was imported to Israel with the arrival of the “German Group” and its absorption into the institutions of authority and research. David Amiran’s role in the introduction of professional ideas from Germany and the design of the atlas into the national political consensus in Israel was crucial. In a country like Israel the most important instrument for carrying out cartographical work, such as the Israeli Survey was in the hands of the political authorities. The question that needs to be asked is whether the information held by the state has to be presented according to political criteria, that is in accordance with the government’s policies, or whether it should be open to criticism and scientific interpretation. Is it, in fact, possible to relate to information of this kind as information with no ideological bias on the part of the mapmaker? Is the creation of the map and its accompanying text nothing but the creation of the “official language” that this same political authority is attempting to instill into society in order to perpetuate its ideas? Do the technical instruments used to carry out the mapping held by a government body provide it with the exclusive use of the cartographical presentation content? And, if so, should one relate to every cartographical publication produced by such a body as being suspect of cartographical propaganda? Despite all the criticism and interpretation one must ultimately reiterate that, in relation to the period in which it appeared and even according to contemporary standards, the “Atlas of Israel” is a great scientific achievement for the State of Israel and its scientists. Its creators made an honest attempt to present information according to the best scientifically objective procedures and were apparently unaware that this aspiration contained within it subjective and ideological assumptions that influenced their professional decisions. One should not see this as something unusual when compared to other national atlases as we have noted in the introduction. When it comes to national atlases such considerations are connected with the survival of the nation, strengthening identification and the perpetuation of the regime’s power through utilizing the different presentations of knowledge, as already claimed by Foucault (Foucault, 1980). i  For a hundred years, up till the year 2000, six editions of the “Atlas of Finland” were published but, for our purposes, the first editions are the important ones. The second edition appeared in 1906 even before Finland became independent and an additional edition appeared between 1925-1929.
ii  For reasons that are insufficiently clear the archives of all the documents from the government survey connected with the first and second editions of the Atlas of Israel were destroyed and were not transferred to the state archives as regulations stipulate. All the documents connected with the beginnings of the atlas from before the Second World War were, however, preserved. The documents of the editorial board of the third edition are still not available for research purposes. iii  Naphtali Rosenan (Edgar Rosenau) (1901-1976) was born in Frankfurt and studied Meteorology and Geography in Heidelberg and Frankfurt. He arrived in Israel in 1933 and worked for the British and Israeli meteorological services. (Gilead, 1981). Rudolf Feige (1900-1948), who worked in the meteorological service of Schlesia and came to Israel in 1936 where he headed the Synoptic Service, was killed in Jerusalem during the 1948 war. Mordecai Gilead (1906-1995) studied natural science subjects, Mathematics and Geography at the universities of Berlin and Frankfurt. He came to Israel in 1935 and worked in the Palestine Survey and afterwards as director of the government meteorological services. Yitshak Schattner (1900-1981) studied Geography and History in Vienna, worked in the department there and finished his doctorate in 1925. He came to Israel in 1936, worked as a teacher in high schools and carried out historical research on the map of Eretz Yisrael. From 1952 until he went out on pension he was a geomorphologist at the Hebrew University (Amiran and Schick, 1982). iv  The details of the biographies of Amiran, his work and the atlas are taken from an interview with him that was carried out on 21.12.98. For an exchange of letters about the atlas, its financing and his first plan as well as the presentation of the first maps to the public in 1937 see the files of the central office for the settlement of German Jews in the Central Zionist Archives, section S 7,file 2057.
v  Dr. Avraham Yaakov Brawer (1884-1975) who studied in Vienna and came to Palestine in 1911 was considered to be the first Jewish geographer in Eretz Yisrael. He was the scientific advisor to the Zionist movement on different geographical matters including borders.